In 1982, the Himalayan Buddhist Meditation Centre (HBMC) was founded in Kathmandu as the Himalayan Yogic Institute (HYI) by Pam and Karuna Cayton, long-time students of Lama Yeshe and Lama Zopa Rinpoche. Pam and Karuna spent several years assisting with the development and running of Kopan Monastery. In the ‘70s and ‘80s, the road to Kopan seemed a lot longer than the road today. It was a rocky, dusty dirt track with potholes and ruts along every twist, bend, up and down of the rural terrain. The road meandered through rice paddies, up and around the terraces, passing a few little houses and stores before making the steep climb up and around the hill to Kopan Monastery. In the monsoon, the road became a rushing river, slippery and muddy that often left Kopan marooned like an island. If a jeep ventured down to town for food and supplies, it inevitably needed to be dug out of a deep muddy bog. Needless to say, taxis to Kopan were expensive and sometimes impossible to find. During the early years when I was living at Kopan, I would hear stories of travelers who planned to go to Kopan, but never quite made it. I thought that we needed to make it as easy as possible for travelers, backpackers and climbers to access the teachings, so it became my mission to remove as many obstacles as possible for anyone who had the wish to learn more about the many Buddhist thangkas, stupas and temples in Nepal and the teachings that all these represented. The idea of starting a center in more easily accessible Kathmandu had been a burning wish in my mind for a year or so. But when I first made the suggestion to Lama Yeshe, his response was, “Not yet, dear.” I must confess I struggled to muster the patience to wait for the right time. When Lama finally gave approval for the center to be founded, we had a small house in town that my sister Dale and her husband Christopher had been living in before they returned to Australia. The house, known as Sano Bhang, was in an old walled garden near the Yak and Yeti Hotel. It was a small historical house (“sano” means “small”) that apparently had been part of the Rana palace that was now the Yak and Yeti. It was quaint and charming with stained-glass windows, and surrounded by a magnificent old garden with a stone pond and big, old picassiette cement seats and jardinieres. 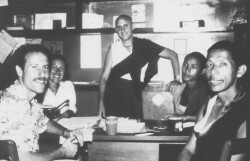 It was here in 1982 that Lama Yeshe first gave us the go-ahead to start the center. As we stood in the garden, Lama said, “I’m going to call this the Himalayan Yogic Institute!” Lama broke into peals of laughter with my obvious apprehension of the name, but it wasn’t long before I had fallen in love with it. The Himalayan Yogic Institute (HYI) was a haven and refuge from the hustle and bustle of Kathmandu – until the hot water heater exploded and blew the roof off our bathroom at 3 a.m. one morning! So in early 1985, we moved from that site to a newer, more contemporary house. One of my sisters, Mandy, was visiting from Australia and she graciously stepped in to take over the management of HYI while we departed for California for the birth of our first child, Jhana. Unfortunately, that house needed to be vacated quite soon and Sangay, Lama Zopa Rinpoche’s brother, became the new director of HYI and it moved to another location where it stayed for several years. It has since moved a number of times and has had many directors, spiritual program coordinators (SPCs) and even a name change (it’s called Himalayan Buddhist Meditation Centre, now)! Who would have thought that 30 years later, Rinpoche would request our daughter Arya to take on the role of SPC? Rinpoche told me on his arrival back in California last year. He laughed and laughed and then said, “I think she will be very good. Her thinking and ideas will be very good for the center.” It’ll be wonderful to watch what evolves in this next phase of this little FPMT center in Kathmandu. May it benefit countless beings! Pam Cayton spent 10 years in Nepal studying Asian philosophy and religion and teaching English to Buddhist monks. In 1989, she started Tara Redwood School in California with the aim of educating the whole child: to convey the joy of learning and also to provide a foundation for emotional and inner development. The success of Tara Redwood School encouraged Pam to found Creating Compassionate Cultures, an organization dedicated to developing training programs, tools and resources and share them with educators around the world. Read Arya Cayton’s reflections on coming to HMBC.